On my many trips with Sri Chinmoy I always captured the beauty and tranquility in nature wherever we were. Now I created a new blog called NATURE & MEDITATION where I will regularly publish these videos for you to enjoy. Especially in the next 10 days there will be a new video every day. Check it out! This is one of my best recordings of Sri Chinmoy’s meditations in close-up. I could record it during the first week-long Anniversary Celebration of Yogamaya (Sri Chinmoy’s mother) in April 1994 in the meditation center “Perfection-Surprise” in Jamaica. NY. Filmed by kedarvideo, Switzerland. Length: 23:52 min. 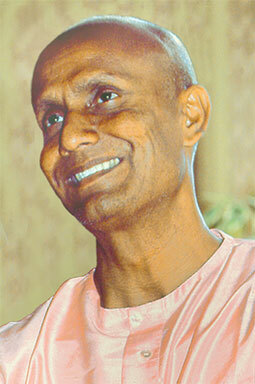 Sri Chinmoy speaks on the secrets of the inner world of meditation. This is one part of a press conference that took place in Stockholm in October 1990. Filmed by kedarvideo, Switzerland. Sri Chinmoy visited Sweden in 1990 and gave a press conference before performing on stage in Stockholm. In this sequence he speaks about love and oneness. Filmed by kedarvideo, Switzerland. Prose you can write. Prose he can write. Prose even I can write. But God writes poetry through you, through him and even through me. Poetry is the shortcut to reach the subtle and tangible Goal of goals-Delight infinite. A poem starts in streaming tears and ends in soaring smiles. The poet beckons tomorrow’s dream-dawn and then transforms tomorrow’s dream-dawn into today’s reality-day. I am a poet. I started writing poems right from my infancy. Before I write a soulful, powerful and significant poem, I concentrate with my vision-eye, I meditate with my liberation-heart and I contemplate with my realisation-soul. And then I focus my life-camera on God’s transcendental Divinity and God’s universal Beauty. There are poets-ordinary poets, great poets. Again, there are seer-poets. The seer-poets are of supreme heights. A seer is he who envisions the present, the past and the future all at once. The great difference between music and poetry is this: music is a universal language. I do not have to learn a particular language in order to appreciate the melody, the soulfulness and the fulness of the music. Just because music has a universal appeal, I can appreciate, admire and love the music. But the poetry that has a universal appeal is the creation of a seer-poet. ‘Seer’ in Sanskrit is drashta-he who has a free access to the past, present and future and has the rare capacity to divinely grow and supremely glow. It is said that poets are born and not made. Unfortunately, I do not and cannot subscribe to this view. There are many, many poets I have seen in my lifetime who were not born as poets but, by virtue of their hearts’ climbing cries and one-pointed, dedicated lives, have become excellent poets. So, as it is true that poets are born, even so, it is equally true that poets can be made. Here in the audience, I am sure there are some who are not poets but, at the same time, have a genuine desire to become poets. To them I wish to offer a few humble and soulful suggestions. You want to be a poet. You can be a poet. You are bound to be a poet. Do not allow yourself to be ensnared by doubt. Self- criticism-no, no, no; self-enthusiasm-yes, yes, yes. Try to free your mind for a few minutes from the coil of thought. Just for a few minutes try to keep your mind silent. I am not saying for a few hours-far from it. Just for four or five minutes keep your mind silent. And then place your silent mind on the beautiful, illumining and fulfilling throne that your heart has created for you. When you write a poem, you can read it time and again-as many times as you want. Each time you read it, you can try to increase your heart’s joy with your imagination-power. Imagination is a world of its own. The Creator has created His creation. He is observing His creation and He is enjoying His creation. In exactly the same way, you can create a poem, you can observe it and you can enjoy it. You are the creator, you are the observer and you are the enjoyer. Poetry is humanity’s aspiration-cry, and poetry is Divinity’s satisfaction-fruit. There are many, many planes of consciousness from which poems can descend. And again, the poet can also climb up like a bird-high, higher, highest-and enter into these planes of consciousness and bring down the loftiest truth, light and delight. A poet can write a poem from the mind proper. He can write a poem from the intuitive mind. He can write a poem from the higher mind. He can write a poem from the overmind and even from the supermind. But when a poet enters into Sat-Chit-Ananda – Existence-Consciousness-Bliss – which is higher than all the planes that I have mentioned, the poet feels that he has covered the longest possible distance. It is like making a long- distance telephone call. But once he reaches this highest plane of consciousness, the Absolute Lord Poet Supreme tells him, “My poet-child, you are mistaken, completely mistaken. Once you reach the Highest, once you become one with the Highest, your journey’s start and the Highest are not at two different places. They are at one place. So it is not a long-distance telephone conversation. You can say it is a local call. On the strength of your heart’s immense cry, you as a poet have reached the ultimate height. Once you reach the ultimate height, the journey’s start and the journey’s close become inseparably one. New inspiring video of the Peace Run activities around the world. Sri Chinmoy’s trip to Southern Japan in October 1993 with an insight in some cultural aspects of the region, the opening ceremony of the 10th World Veterans Championships with his participation in the 100 m sprint as well as a summary of four beautiful concerts with meditative music. This was one such meditation. Filmed by kedarvideo, Switzerland. 25 years ago: During the first Yogamaya Celebration in April 1992 Sri Chinmoy meditates in the Sri Chinmoy Centre in Jamica, NY. Filmed by kedarvideo Switzerland.